There are 3 arms to the Theratrak platform. Therapists have access to a Mobile app and Clinic portal and clients have access to the client portal. Create customised therapy home programs for children using the Theratrak mobile app. Manage all clinicians in one space. Monitor and track therapy progress of clients on the platform. Capture meaningful information using photos and videos of your clients completing activities, during their session. Don’t have an account yet? Register here to join the platform. 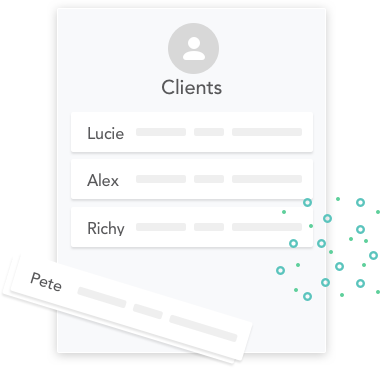 Create accounts for your therapists for your clinic by adding them to Theratrak. Therapists will then receive and invite to register a password through their emails. They will then be directed to download the app and they can start using it with their clients in clinic. Click here to watch an overview of the app and it’s features. In the clinic portal you can see the list of all the clients in your clinic who are using Theratrak. Therapists will also be able to see their clients specific to their caseload. Therapist can monitor and track individual client therapy treatment progress. Receiving real time feedback from clients about their completion of their set home programs.